Uganda’s Health ministry on Wednesday said there is no Ebola case in the country after blood tests from a man suspected to have died of the haemorrhagic fever was found to be negative. “Samples taken off from the deceased tested negative for Ebola. Ministry of Health and partners remain vigilant to prevent importation of any case of Ebola into Uganda. There is no confirmed case of Ebola,” the ministry tweeted on Wednesday. 13 individuals from the eastern district of Tororo had been quarantined on Tuesday over fears that they might had contact with the victim. 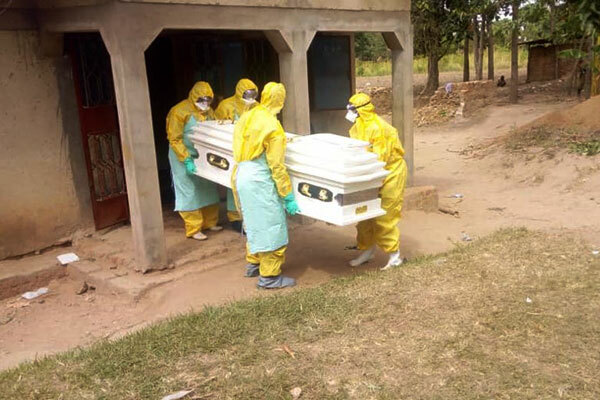 They had repatriated the body for burial from Democratic Republic of Congo, which neighbours Uganda to the west, where Ebola has claimed 500 lives. The Ugandan man died of a disease with Ebola-like symptoms. “Thirteen people from Tororo went to collect the body and passed through the border check point in Zombo district and proceeded to Tororo,” reads a joint statement by the ministry of health and World Health Organisation (WHO). The 46-year-old had been admitted at a hospital in eastern Bunia town in DR Congo since November 2018 complaining of chest pain and cough. He died on February 8, 2019, according to the statement. Bunia is in Ituri province where WHO says a few suspected Ebola cases have been reported. He had been living in DR Congo for the past eight years, where he worked as a mason. The government supervised his burial on Tuesday. DRC declared the Ebola outbreak on August 1, 2018. Neighbouring countries Uganda, Rwanda and South Sudan have been heightened Ebola surveillance and prevention preparedness. There are fears that DR Congo’s porous borders, militia groups, ethnic violence and weak health infrastructure could make it easy for Ebola to spread to the neighbouring countries. Uganda’s health minister Dr Jane Ruth Aceng says that at least 3,587 frontline healthcare workers have been vaccinated. Regular travellers into the country from DR Congo are required to wash their hands in chlorine at border posts as one of the measures to prevent the virus from spreading.